The image is clear. An imperfect oval of open ground, the colour of clay staring at you unapologetically, a flamboyant tree standing on the edge, bent but firm and showing no signs of its age. However, somehow, it also seems like the image of a frighteningly open wound, the result of a bruising battle. It's the image of a joggers' track left unfinished, its completion unsure. "The project was written up since 2009 by the Lindo Park Improvement Committee for the lighting of the football area, the fencing and a joggers' track," said Daniel "Danny" Lugay, the MP for Roseau North and member of the Roseau City Council. The committee, formed in 1996, secured funding from Australia and New Zealand to improve Lindo Park, making it more user-friendly and useful to the people of Goodwill, Lugay explained. They met with the mayor to discuss the project - the city council is responsible for sidewalks – and sat with the planning division to talk about their plans. 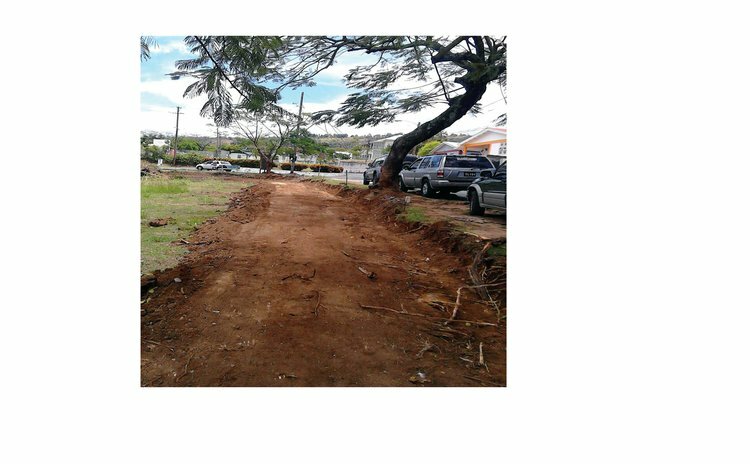 "(Committee chairman) Justine (Nibbs) spoke to people at planning and they told us they were thinking of widening the road so we knew where to do the joggers track to take into consideration the widening of the road," Lugay contended. With AUD$33,000 (approximately EC$70,000) in their hands from the Australian high commission, the committee paid the Dominica Electricity Services (DOMLEC) over EC$18, 000 to set up the poles and ready the area – DOMLEC contributed over half of the actual cost, Lugay said – and called in the excavators. Then, as smoothly as things appeared to be flowing, work was forced to come to a sudden end. "We started to wider the jogging area, but when the bobcat came in about the 10th of April we got a letter from Marcus Lestrade, the director of surveys and commissioner of lands, telling us that it was illegal occupation of state land at Lindo Park (and) 'please be advised that you are to cease operation immediately and remove all equipment.'" This letter stunned the committee, said Lugay, because they have been managing Lindo Park for just short of 20 years. "Since that time we have done work without any interference by any government. We built the basketball court and lighting, we never had problems with planning permission. We've planted trees, we done cricket pitches, we removed cricket pitches... over the years all governments have recognized the Lindo Park Committee, even Labour Party, when they were having political meeting wrote us to seek permission to use the park," protested the Roseau North MP, who also serves as secretary to the committee. However, they replied to the letter, apologizing and seeking an audience with the minister, Reginald Austrie, in an attempt to resume the project. "We are still awaiting a response and up today, we have still not been able to see the minister, Reginald Austrie, to get the project restarted. They seem to think it's a Danny Lugay project and they decided to stop it dead. We sent them two letters apologizing and they refuse to see us." Several calls to Austrie by The Sun went unanswered and he did not respond to a message left on his voicemail seeking comment. However, one community leader who has been associated with Dominica Labour Party (DLP) told The Sun it was a simple matter of a committee overstepping its authority. "I think the fellas probably overstep their boundaries, but the park doesn't belong to the committee…it's government property," said this leader who sought anonymity because he is no longer active in the community. This person, who is familiar with government thinking, confirmed there were plans to broaden the roads around the area, adding that the Lindo Park project would interfere with some of these plans. "The new road coming from Bath Road, they are going to go around Dupigny Lane and Charles Avenue. When you do the road, the walking lane, that is where you have to plant the trees, because you are going to have to cut the existing trees and you have to plant new trees and their walking lane is where they will plant the trees." In the meantime, Lugay said he was baffled by the government's action, but the committee can do nothing but wait. "We waiting to see what happens. As the parliamentary representative the next place I will address that is in parliament. You cannot be stopping a project that will benefit the community like that. I can't see how two embassies can come together to support a project like that and the government is getting in the way." The committee was hoping to complete the project in time for the Australian cricket team's visit next month. Instead it stands incomplete, with a gaping uncertainty, symbolized by the open jogging track displaying nothing but dirt.